A common misconception with countertop fabrication and installation is that cabinets, walls, floors, and other surfaces are always perfectly squared, leveled, and evenly placed. Nothing could be further from the truth. This is the reality of the situation, whether the job site is a new construction or a remodel. Fabrication and installation technicians are regularly presented with preexisting imperfections that are not within their control. With the exception of completely customized designs, countertops are cut straight and at 90 degrees. Reconciling perfectly cut countertops with imperfect surrounding surfaces takes some creativity and ingenuity. 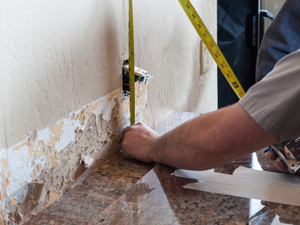 A quick test with a laser level inevitably reveals inconsistencies in heights, widths, lengths, and angles of floors, walls, and other surfaces that directly affect countertop installation. Experienced fabrication and installation technicians will take time to identify imperfections in wood and metal framework, sheetrock, panels, and other surfaces and formulate strategic plans to resolve those inconsistencies and achieve the best possible results. Cabinets are the foundation for countertops. An improper foundation will result in an improper installation unless experienced technicians can make tough calls on how to fill in gaps. They may choose to shim a countertop from underneath to bring it level, make minor adjustments to the standard 1.5 inch overhang, or use a backsplash to cover gaps. On the job site, discrepancies as small as a 16th of an inch may warrant on-site trims. Feel free to contact us with any questions or concerns you may have about your unique kitchen or bath and learn how our experienced, highly trained technicians can accommodate your particular needs during our countertop fabrication and installation processes.